The BMW V8 engines are durable and long lasting, but being aluminum, they are not robust enough to tolerate improper machining or assembly, and are not suitable for all performance applications without proper measures. Proper machining and assembly is crucial to the success and longevity of the BMW V8s, especially when over boring or sleeving the block. The VAC Engine Block Torque Plate 'loads' the block as if a head was already fitted. This torque applied to the block simulates the final assembled product and ensures that the cylinder walls are bored and honed perfectly round when final assembly is complete.BMW engines are precision equipment, greater care when machining an engine will assure you are off to a great start. Larger displacement 4 cylinder engines endure harsh harmonics and loads, proper machining and assembly is crucial to the longevity of your engine, stock rebuild or full race. 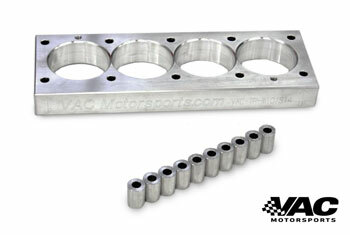 The VAC Engine Block Torque Plate 'loads' the block as if a head was already fitted. This torque applied to the block simulates the final assembled product and ensures that the cylinder walls are bored and honed perfectly round when final assembly is complete. One Torque Plate is supplied to be used for each bank of cylinders, one at a time. Please choose Purchase or Rent from the menu above. Both choices will charge $324.95+ Shipping, however with rent option, you can then return the undamaged plate for a $175 credit. You only pay $150 Rental fee. Sales are available globally. Rental is available to USA customers only.